Bitter Seeds is an incredible fantastical look at what could have been if some of the rumored Nazi science was true. A group of partially-electronic genetically modified Nazi soldiers face off against the magic-aided British troupes - what isn't there to like about this concept? 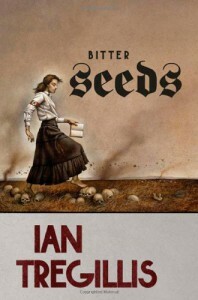 Bitter Seeds is well-written, engaging and entertaining. The characters are realistic, relateable and sympathetic. The dialogue is believable, organic and free-flowing, and feels absolutely feasible. The book, in a whole, was enjoyable and fun. The story falls a bit flat at times, and towards the end it jumps around enough that it could be seen as confusing, even for experienced readers. That said, the overall story was excellent, the writing was above average, and there's a lot to look forward to in this series.